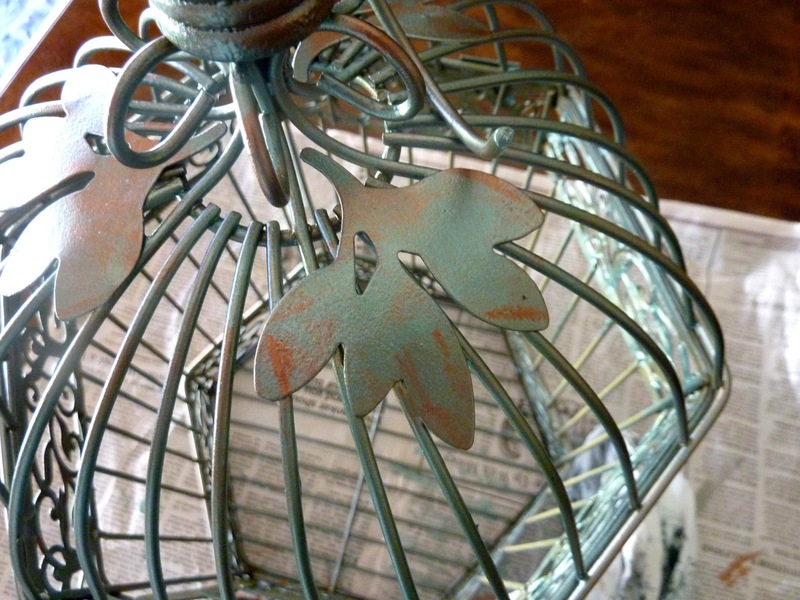 Creating Wonderful Spaces: Instant Patina! 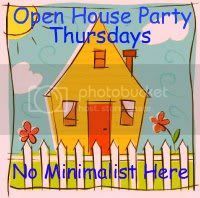 Welcome to Metamorphosis Monday! I thought I would share a paint treatment I did last week. 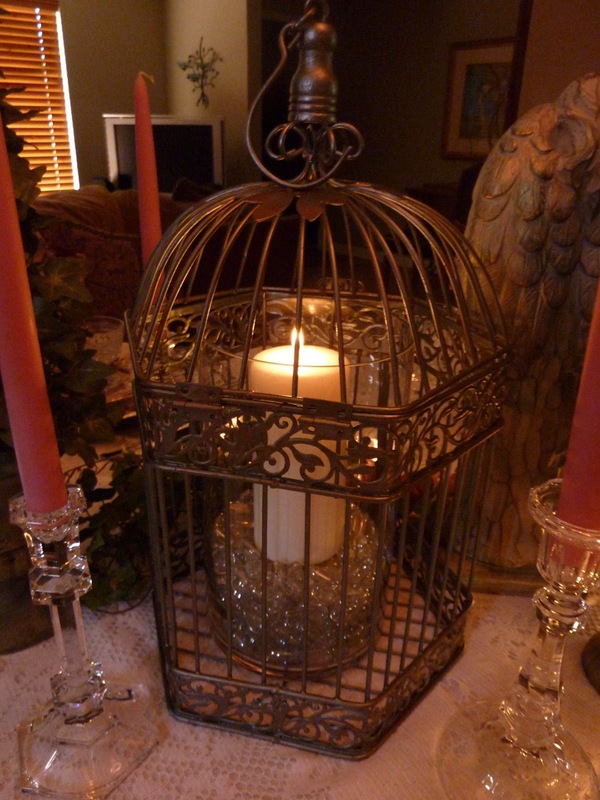 I purchased a birdcage from Ross for $8.99. It was a medium brown color and though it had some pretty details, I wanted to give it more character. 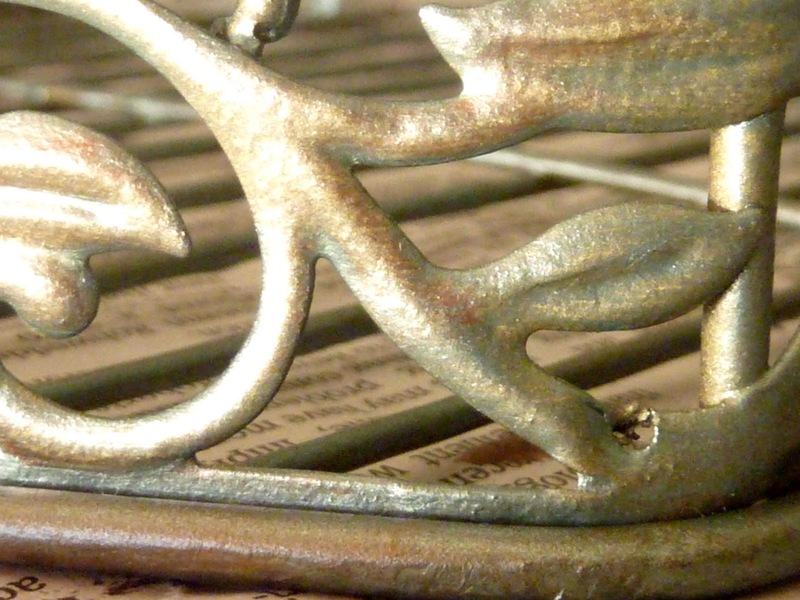 The first thing I did was spray paint the whole cage a hammered gold. 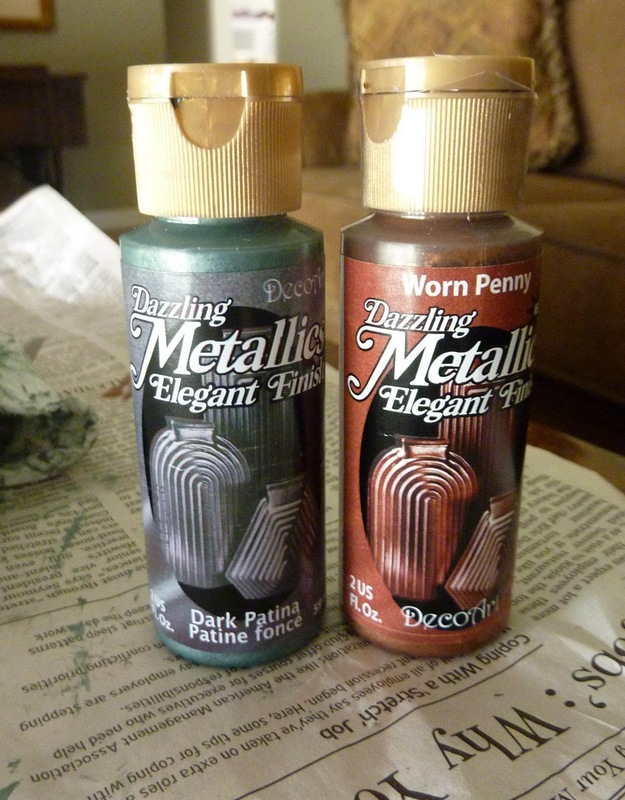 I bought craft paint in two colors: Dark Patina and Worn Penny. 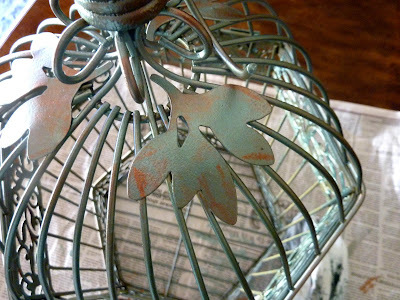 I dabbed the patina color on the cage with a sponge brush. Before it could dry, I used a cloth to wipe some away. I did the whole cage twice, building up the amount of paint. Meet Eddie, my assistant. After the paint was dry, I went over it again with the Worn Penny color, dabbing it in areas where it would look natural for rust to appear. Again, I used a cloth to wipe the paint until I got the effect I wanted. 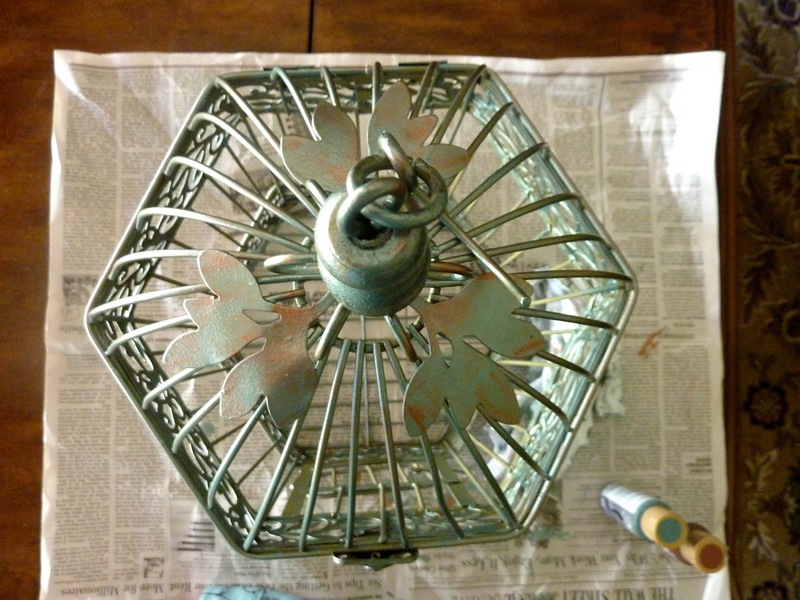 The paint dries quickly, but if you have an area you don't like, you can just redo it. I was very happy with the way it turned out. The gold, patina, and copper color gave me the effect I was looking for. The birdcage no longer looked new. 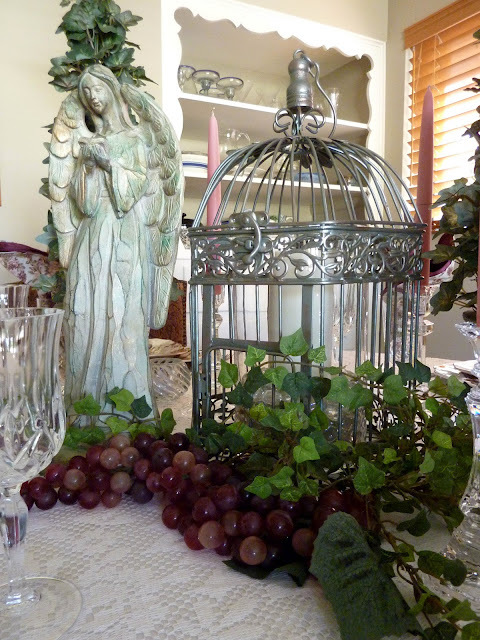 An hour after I started this project, I used the birdcage in a tablescape. I put some flowers and vines inside the birdcage, but I wasn't happy with it. Then I tried a glass cylinder with clear beads. I put a pillar candle inside the cylinder and voila! I had the look I wanted. 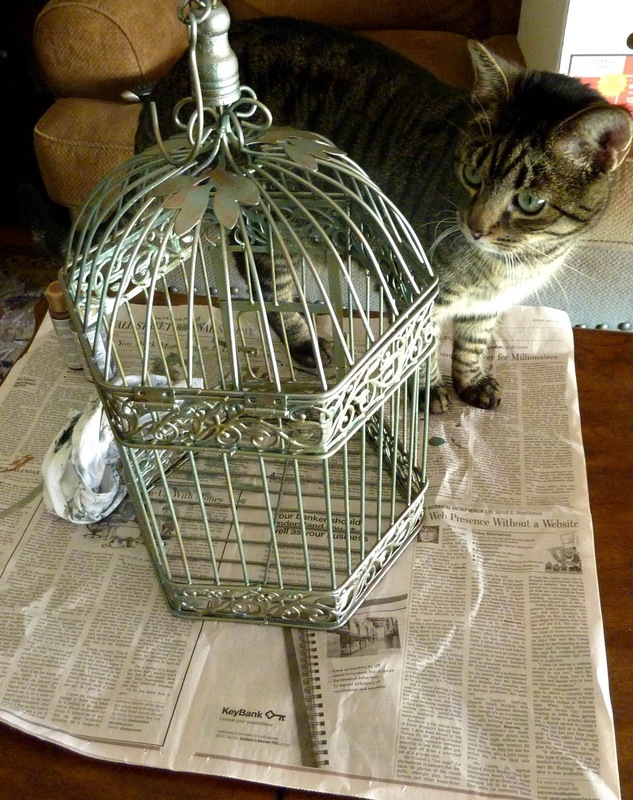 I have a feeling this birdcage will be painted over and over again. 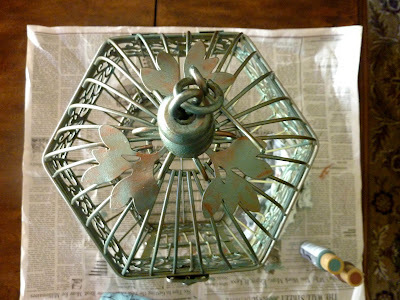 But, a buildup of paint will only make it look more vintage. Eddie and I thank you for joining us today! 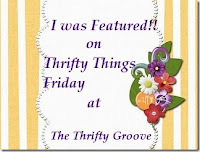 Linking up to Thrifty Decor Chick's November Before & After Party! That looks wonderful! I love the two colours you chose. The Worn Penny shading is very effective. Great job! Thanks for stopping by my blog today and for taking the time to leave such a kind message. So that's how you did it! Thanks for the tutorial. Something tells me some birdcage painting is in my future. It really brings out the details. Gorgeous! It turned out great. Thanks for sharing. 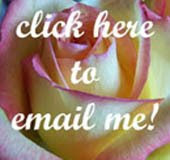 Thank you for visiting my blog & for your sweet comments. You did a beautiful job on the birdcage! Great colors, artfully applied! I'm trying to follow you but your followers are not showing up. I do have you in goggle reader for now. Oh, this turned out gorgeous! You did such a beautiful transformation! Your bird cage came out so pretty. Your addition made it not only prettier, but your own unique creation. Great job.